Focus: Current firearms instructors who desire or require instructional recertification in the handgun. Also open to agency personnel seeking to become firearms instructors as a "pre-instructor certification training course" prior to attending a full instructor course. The instructor develops more knowledge and experience in teaching officers. The instructor develops bad habits or lapses in the training delivery because of natural shortcuts taken, becoming blind-spots in the training delivery that eventually become ingrained in the instructional routine. This instructor recertification course provides the opportunity to learn from those who originally developed the concept of combatives training on the range--and then constantly improved upon that concept. It provides a chance to learn new ways of teaching officers "from the street in, not the range out." We believe that if you can do something on the street with a firearm at the ready when someone is attempting to take your life, you should have already practiced that movement, tactic, or solution to the problem on the range. 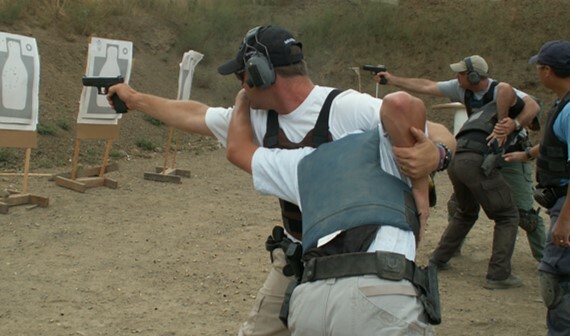 Movement on the range with live, loaded weapons should reflect the same movement and actions routinely seen in the street when officers have their handguns in their hands. We believe that officers should be trained to solve their problems on the range and in a safe manner that will carry over into the street. While Cutting Edge Training instructional certificates don't require recertification, periodically attending another instructor or recertification is the key to remaining relevant and on top of the latest training theory and practice. We constantly update our courses through our own research and personal training to bring what we believe to be the most valid and functional firearms employment theory and training possible. We are a continuous improvement training company, and we promise you that you will never attend a course that is exactly the same as the last one you attended. We will always bring something new and from a unique perspective to every recertification course for you to consider, attempt, and employ to save your life and the lives of the officers you train. This is an instructor's course, not an enhanced user's course. Most firearms instructor and recertification courses are about making the individual attending the course a better user. That's all mildly interesting, but irrelevant to the ultimate purpose of training your officers to become better at responding with deadly force. We believe in increasing your firearm instructor's ability to teach your officers how to put bullets on-target, in-time, and on-time. "Instructor courses" should be focused on how to better deliver training to the end-user. Our courses are about teaching police skills and tactics and law and policy and combatives in an integrated method that translates directly to the effectiveness of each officer--both your best and your least capable officers--on the street to save lives. Because saving lives is why officers carrying firearms and your best and your least capable officers deserve only the best efforts of their agency instructional staff in delivering a firearms training program that gives them the best chance of coming home after an OIS.